International engineering consultancy Web Structures has been appointed to help create a £60 million development in Malaysia that includes restoring the site of Sir Stamford Raffles’ historic home to all its former glory. The Runnymede masterplan in Georgetown, Penang will see the creation of a stylish mixed development of offices, retail, houses and luxury apartments as well as a top hotel. The 1,000,000 sq ft, four-year project, for developers, Warisan Pinang Sdn Bhd, a member of the Prima Prai Group, has been designed by highly-acclaimed Kuala Lumpur-based GDP Architects. It includes the careful restoration of the Runnymede property which was originally the home of Sir Stamford Raffles, founder of Singapore. The original single-story colonial house, built in 1807, was named Runnymede after the field on which King John signed the Magna Carta. That property was destroyed by fire in the 1920s and a glamorous and internationally-famous hotel, with its impressive ballroom and cocktail parties, was built on that site in the 1930s. The British Navy took over the hotel in 1940 and it was used as a base by the Japanese during their occupation. Post-war it was in British military hands until 1957 when it became the property of the newly-independent Malaya. Web Structures will be involved in preserving that historic building during the development work and in the restoration of Runnymede. The building is earmarked to reclaim its historic importance, forming the heart of this high profile development. The civil, structural and geotechnical engineering consultancy, which has offices in London as well as Singapore, Kuala Lumpur and Shanghai, will bring all its expertise working on challenging projects across the globe to the Runnymede development. 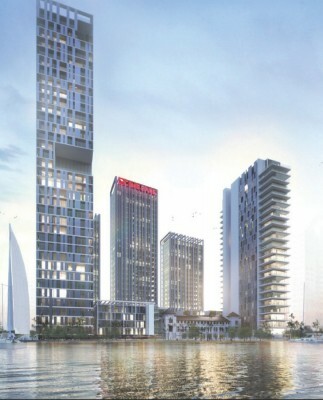 Dr Hossein Rezai, group director of Web Structures, said: “This is a major, landmark development in Penang with a great mix of properties, from luxury apartments to offices and shops in a fantastic setting. “The conservation of the old hotel building will require some delicate work. We have to ensure that the new development work does nothing to harm that building as it takes place around it and also involves work underneath it. Founded in 1996, Web Structures has worked on more than 400 projects in over 24 countries. It has also been involved in the development of more than 52 residential and mixed-use skyscrapers around the world. Other major architectural practices it has worked with include UN Studio, Kohn Pederson Fox and Maki and Associates. Its team is currently working on a new studio complex for UK-based Pinewood in Malaysia. It has also won the contract to help create a £15.7 million new research and development facility for Munich-headquartered global electronics giant Rohde & Schwarz. The architects are Forum Projects. Web Structures has an enviable reputation for its work on some of the biggest and most challenging construction projects in all parts of the world. It has engineered more than 52 residential and mixed-use skyscrapers around the world in the past 15 years, including the iconic 50-storey Troika development in Kuala Lumpur the 40-storey Queen’s Condominium in Singapore and 61-storey Northpoint in Thailand. It is also heavily involved in creating some of the tallest towers in cities across India.